Special Holiday Hours through January 4th: open until 9PM! Normal exhibition hours are Sunday - Thursday 10:00 AM to 6:00 PM and 10:00 AM to 9:00 PM Friday and Saturday. Last ticket sold 60 minutes before closing. THE ART OF THE BRICK is a global touring exhibition rated by CNN as one of the world's "Must See Exhibitions." 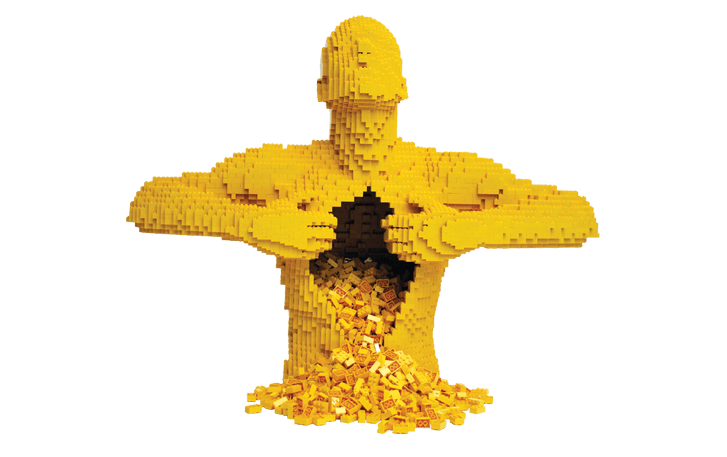 These are the first art exhibitions to focus exclusively on the use of LEGO® bricks as an art medium and artist Nathan Sawaya has taken it to new heights. This award-winning artist has multiple unique exhibitions created solely from standard LEGO bricks often with several new sculptures created specifically for each exhibition. Each show has countless colorful LEGO pieces which Sawaya has transformed into whimsical and awe-inspiring creations. Sawaya’s ability to transform this common toy into something meaningful, his devotion to spatial perfection and the way he conceptualizes action, enables him to elevate what almost every child has played with into the status of contemporary art.